PROPERTY SUMMARY A three bedroom corner property which is situated in a popular residential location yet within easy access of local shopping amenities, bus routes, recreation grounds and within catchment of both Solent and Springfield Schools (subject to confirmation). The house has been in the current ownership for over three decades and although well maintained it does require some updating and redecoration. 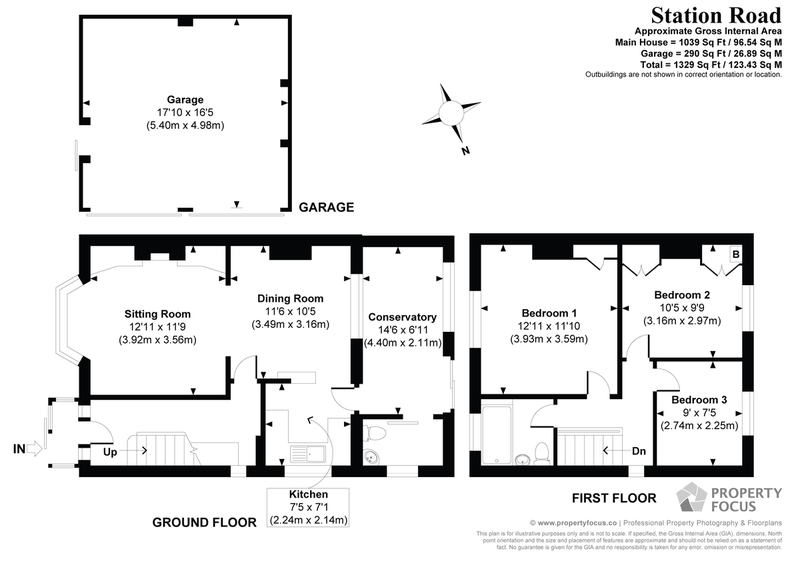 The accommodation comprises; hallway, dining room, sitting room, kitchen, conservatory and cloakroom/utility room on the ground floor with three bedrooms and bathroom on the first floor. Having gardens on three aspects, off road car parking for approximately two cars as well as a double garage, double glazing, central heating and no forward chain early internal viewing is strongly recommended in order to appreciate both the accommodation and location on offer. SITTING ROOM 12' 11" x 11' 9" (3.94m x 3.58m) Double glazed bay window to front aspect with double radiator under, ceiling coving, power points, central chimney breast with low level shelving to either side. CLOAKROOM / UTILITY ROOM 7' 0" x 4' 0" (2.13m x 1.22m) Double glazed frosted window to side aspect, range of shelving, washing machine point, power points, corner wash hand basin with tiled splashback, low level w.c.
FIRST FLOOR Landing with balustrade, frosted window to side aspect, doors to primary rooms. BEDROOM 1 12' 11" x 11' 10" (3.94m x 3.61m) Double glazed window to front aspect, radiator, power points, built-in storage cupboard housing hot water cylinder and range of shelving, ceiling coving. BEDROOM 2 10' 5" x 8' 6" (3.18m x 2.59m) To front of built-in wardrobes (9'9" max) to either side of chimney breast, one housing boiler supplying domestic hot water and central heating (not tested), double glazed window to rear aspect, radiator, power points, ceiling coving. BEDROOM 3 9' 0" x 7' 5" (2.74m x 2.26m) Double glazed window to rear aspect overlooking garden, ceiling coving, radiator, power points. BATHROOM Coloured suite comprising; panelled bath with hand grips, separate shower over with shower screen, double glazed frosted window to front aspect, pedestal wash hand basin, low level w.c., fully ceramic tiled to walls, access to loft space, radiator. OUTSIDE To the front, accessible from Station Road via a gateway is a pathway leading to main front door, to the right hand side of the property is a pathway with lawned garden and rose beds to one side, enclosed by manicured hedge, external cold water tap, pathway leading to rear garden, further rose bushes and raised borders. To the rear of the property, via a pedestrian gateway and fencing. CAR HARDSTANDING 19' 0" x 17' 9" (5.79m x 5.41m) To the front of double garage is hardstanding 19'0" in depth x 17'9" in width, passage way providing pedestrian access to the rear of No.34.